Many believe these falls to be one of the most beautiful in New Zealand, just a short drive from Waitomo Caves. 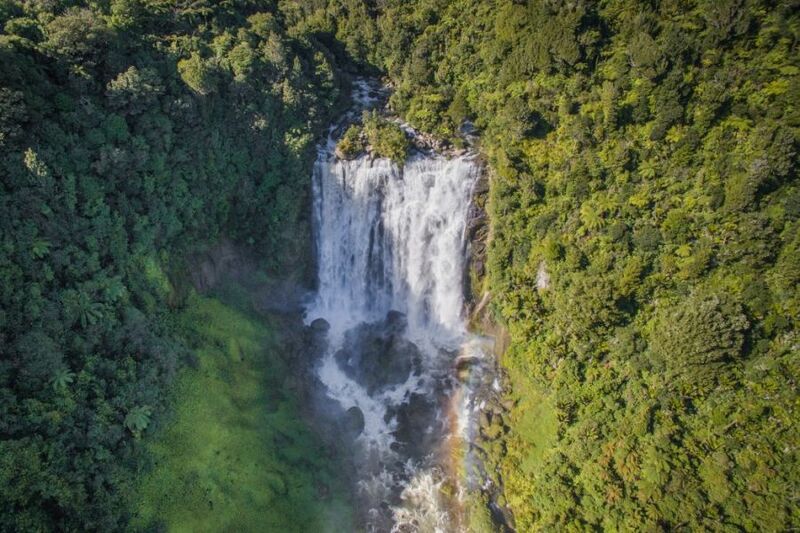 Take a scenic drive towards the tiny west coast village of Marokopa to discover a truly dramatic view, as here you will find one of New Zealand's most stunning (and secret) waterfalls, the Marokopa Falls. The return drive from Waitomo Caves has a variety of short walks you can stop and trek on your way. This short-walk, only 20 minutes return, passes through native tawa and nikau forest to reach the viewing platform for the dramatic falls. The 35m high waterfall divides the Marokopa River into two fisheries, providing popular trout fishing spots along the river. If you're travelling to Waitomo Caves for an underground adventure, be sure to take the time for the short drive out to the falls, located just 30 minutes drive west of the village, it is not to be missed. Walking time: 15 - 20 minutes return. Distance from Waitomo Caves: 29km.